Taking out a small personal loan can be a good strategy for repairing bad credit or bulking up thin credit. What’s not so clear is how bad credit or thin credit will allow you to do that. Credit builder loans might be the answer, typically ranging from $500 to $1,500. When secured by loan funds or collateral, credit builder loans do not rely on your credit for eligibility. And provided you pay as agreed, they help build your credit score. When you are approved for the loan, you don’t get the money right away. Instead, it goes into a savings account or certificate of deposit (CD) that you cannot access. You make your monthly payments on the loan and, once it’s paid in full, the money (in savings or CD) is released to you. If you already have a savings account with a bank or credit union, then it can serve as the collateral for the credit builder loan. Your savings account gets frozen, which you only regain access to once the loan amount is paid off. You may also be able to use your car as collateral, but that’s riskier business. If something unforeseen happens, and you default on the loan, losing your car to the lender will probably hurt more than losing money. Since you are borrowing against money — or a car — that actually belongs to you, it should mean a lower interest rate than if it’s the institution’s money that is securing the loan. It is possible to get a credit builder loan without any security at all. But it will probably be harder to qualify for (as it will likely rely on your credit history) and if you do qualify, the interest rates will likely be much higher than a secured credit builder loan. Don’t expect to see credit builder loans offered by big banks. They’re typically only offered by credit unions, community banks, and non-profits. And even then, they’re not the kind of thing that get much advertising. In other words, you’re probably going to have to dig for them. Here’s how. 1) If you already have an account with a credit union or community bank, ask if they offer credit builder loans. If not, then open an account with a credit union or community bank that does. You’ll likely need to have an account with them in good standing for a number of months before you can be approved for a credit builder loan, so the sooner you open your account, the better. 2) Broaden your search of credit unions, community banks, and non-profits with Community Development Financial Institutions and Consumer Action’s list of credit-builder loan programs. 3) Check out Self Lender, an online provider of credit builder loans. Qualifications will vary from lender to lender. 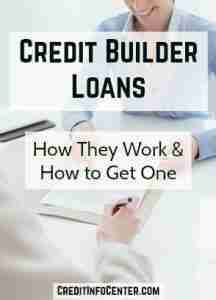 As with qualifications, the cost of a credit builder loan will vary from lender to lender. Generally, though, you can expect interest rates from under 10 percent (for secured loans) to over 30 percent (for some unsecured loans). Self Lender also charges a $12 administration fee. Of course, secured credit builder loans — held in savings or a CD — will earn interest for you, too. But the interest rate will be negligible so it won’t offset the cost of the loan by much of anything at all. When you take out a credit builder loan, the lender agrees to report your payment history to the credit bureaus every month. Ask about this specifically. Because if they do not report to the bureaus, it is not a credit builder loan. And if they don’t report, it won’t help your credit and you’ll be paying on a loan for no good reason at all. If you are credit invisible, this monthly reporting will help you get on the credit map. Note, you’ll start with a FICO Score XD and be upgraded to a traditional FICO Score after 6 months. As for VantageScore, you can expect a score to be generated after 30 days. If you already have credit, it should give your score a boost, though there is no guaranteed number of points you can expect it to improve. Of course, getting any good out of all this depends on you pay on time. Lenders are going to report your payment history either way so, by all means, don’t pay late. The only thing worse than having no credit is having bad credit. And the only thing worse than having bad credit is getting behind on a loan that ends up dropping your score even more. Unless you need the money for an emergency situation — like car or home repairs, or medical bills — don’t apply for an unsecured credit builder loan. Yes, it’s nice to have the loan funds released to you immediately, but the accompanying interest rates may be too steep. Opt instead for the lower-interest secured loan, which means the money is not accessible to you until after you have made all of your payments. If you’re able to secure the loan with your own money, great. If not, a loan secured by the loan funds is still a good deal, with interest rates typically lower than the unsecured version. They won’t check your credit — and you’ll get the money right away — but the interest rates on payday and title loans are astronomical. Also, they do not report to the credit bureaus (unless you default and what you owe goes into collections), so there is zero chance payday loans or title loans will do anything to help your credit. In fact, chances are good they will only make your financial situation much worse. Get the facts about payday loans and title loans. And, again, be sure the lender reports to the credit bureaus. Just one late payment on your credit report can drop your score by 100 points. So, by all means, pay your credit builder loan on time. If you’re not certain you’ll be able to this — especially if you’re already struggling to make ends meet — don’t take out a credit builder loan until you’re more financially stable. The risk of missing payments is just too great, as is the possibility of making your credit even worse. As good as it might feel to pay off your credit builder loan early, even if you have the money to make it happen, don’t do it. Sure, you’ll save on the interest fees, but you’ll also miss out on logging additional on-time payments. Note, this advice does not apply to other loans going forward. In general, it is always a good idea to pay off debt as soon as possible. It not only saves you money in interest fees, but also lowers your credit utilization ratio. While a credit builder loan can be a great alternative to a secured credit card (and vice versa), having both can give your credit an even bigger boost. You’ll not only benefit from having multiple credit accounts through which to build positive credit history. It will also give you a credit mix — an installment loan (the credit builder) and revolving credit (the credit card) — which counts for 10 percent of your FICO Score and is “highly influential” on your VantageScore. Though you will have to come up with the initial deposit to secure the credit card, they’re available for as little as couple of hundred dollars. That money gets set aside into a secure account (though not one that earns interest, like the credit builder loan savings account or CD does), and you get it back when you upgrade to a traditional card. You build credit by using the card at least once a month and returning the balance to zero every month. As with credit builder loans, though, just be sure to apply for one that reports to the credit bureaus. Learn more about secured credit cards and shop around for the best deal. It’s also important to monitor your credit – not only to be sure your positive credit is being reported, but also to catch and dispute mistakes that could be hurting your credit. Get more detailed tips in 9 No-Nonsense Ways to Build the Best Credit.